From at least eleven years ago Jan had a yearning which was to walk the length of New Zealand. There was no trail as such at that time but that didn’t dampen her enthusiasm. The years went by and then in 2011 Te Araroa was officially opened and along with that her interest went up a few notches. We have been hiking trails a couple of times a year, usually November and February, for around a decade, so of course Te Araroa would come up in the conversations on where to hike next. I was not keen at all to walk the long pathway, mainly from the necessity to have around four months off work, which would be near impossible for both Jan and myself. So as not to crush her dream I would say that we should take a look at hiking it after we retire. It did get me thinking about, researching Te Araroa and just wondering if she really knew what she was getting herself into because after all she was once a Jafa. So in a devious move I suggested we should ratchet up to trying a harder tramp and in Feb 2016 that is what we did. Little did she know that The Southern Circuit on Stewart Island was going to be ‘boot camp’ for Te Araroa. I had completed the Northwest circuit in 2010 so knew it had a reputation of being much harder than that. It didn’t disappoint with the first and last days the only fine days with rain, wind, and fog featuring on all the other days. 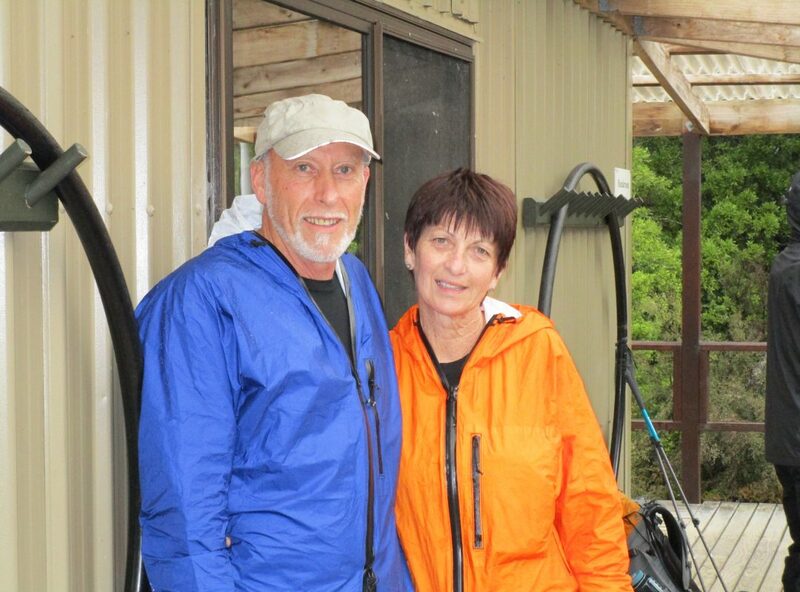 From the blogs I have read the mud on Te Araroa is for the most part below the knee, not so on The Southern Circuit, as Jan found out. So after 12hrs on the track it was around 8pm with still an hour and a half to the next hut, and while navigating a minefield of muddy bog holes, in she went waist deep with only her pack stopping her from going deeper…….I had two options, grab the camera and take a photo or help her out…….fortunately for me I chose the latter. It’s fair to say that she is probably slightly taller now because I nearly pulled her arms out of their sockets getting her out of that mud……and her assessment of The Southern Circuit? Well she loved every moment of it, and I was more than convinced that she could handle anything that Te Araroa could throw at us. A problem still remained however, being the time needed to complete it, so after much thought and discussion we decided we would take 5 weeks off work and walk south bound (sobo) and hopefully make it to at least Auckland or preferably close to Hamilton where we would leave our car. Those five weeks would also determine whether we did or could carry on to complete the rest of the Trail as time would permit. Doughboy bay hut, Southern Curcuit Stewart Island, is the most southern DOC hut in New Zealand.